I decided it was about time to get my position double checked and do some minor tweaks here and there in terms of equipment. So right before my altitude camp in Flagstaff, I flew to Charlotte to get tested in the legendary A2 wind tunnel. Mike Giraud is not only my friend, but he is also the boss when it comes to the tunnel, and he was able to find out a few interesting things that helped me get even more aero and ready to face the wind in my upcoming races across Europe and the USA. This gives a bit of insight for @ThierryHensen and @olle_norberg who asked me specific questions about my race nutrition and recovery. I will hit on that in more detail as Kona approaches. The #KonaCountdown continues…tweet your questions to @dirkbockel #KonaCountdown, and I will answer them in my weekly blog post. We are now a little over 7 weeks out of Kona, and that means a new video is coming up soon… stay tuned. 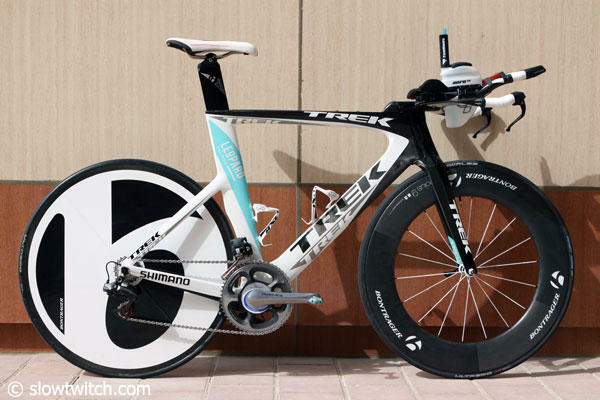 Herbert Krabel got a close up of my bike while I was in Abu Dhabi this year. Check out the Slowtwitch highlight HERE. Many thanks goes out to Blue Competiton Cycles for hooking me up with my new 2012 Triad SL. She’s going to get the ride of her life out on the Queen K on October 8th.